There’s just something about hardwood flooring. It has a warmth and luster that can’t be matched by other hard flooring options. Besides tile, it’s one of the oldest flooring options available, which is why you’ll find hardwood in homes that are centuries old. Those old floors still hold up today! You simply can’t find a more durable, longer lasting and attractive flooring option than hardwood. We here at Zakian Rugs, oriental rug cleaners serving the Greater Philadelphia area and purveyors of carpeting and hardwood flooring love hardwood almost as much as we love oriental rugs and we’re excited to share this short guide with you. As we said, hardwood flooring has been around for centuries. These old floors are solid wood, meaning that the entire flooring plank is cut from a single piece of wood. Solid flooring is still an excellent choice, with unbeatable wear and durability features. Solid flooring today is sold alongside a new entry into the category, engineered hardwood floors. These take advantage of modern technology to create flooring that has a veneer of hardwood glued to a layered wood substrate. Both solid and engineered flooring have their advantages and disadvantages. Because solid hardwood is comprised entirely of the hardwood species you selected it can be refinished many times. This greatly increases its useful life. When it starts to show its age and dings and scratches in the finish become too great you can sand it and restain it for a brand new looking floor. However solid hardwood, depending on the wood species, is generally more expensive than engineered wood floors for the simple reason that it’s solid wood. Engineered flooring is mostly plywood, which is a much less expensive wood. Engineered hardwood floors are less expensive than solid wood floors, which means lower budgets can afford some of the nicer styles and more expensive hardwood species available. Also, because of the way the plywood base is layered it is far more dimensionally stable than solid hardwood, so it’s less likely to warp or flex over time, particularly in areas where moisture is a problem. However because the hardwood layer is just a thin veneer, engineered floors can’t be refinished nearly as many times as solid wood floors, and they’re more susceptible to damage in general. We’re oriental rug cleaners serving Greater Philadelphia and we sell both solid and engineered flooring options. Come down to our showroom and we can discuss which option would be better for your home. Cherry is a very popular hardwood with strongly reddish overtones. Even more so than oak, cherry fits well in traditional style homes. Cherry gives a house an upscale appearance. However it is softer than other hardwoods so it’s a bit more damage prone but still wears well. It tends to be one of the more expensive of the common hardwood species. 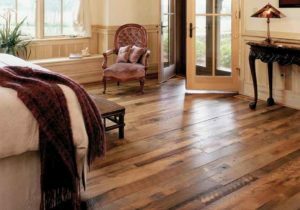 This wood, particularly in wide plank styles gives a home a very rustic appearance. This has to do with walnut’s wide, swirly graining and inconsistent color characteristics. It’s often stained darker, to take advantage of its natural colors. Like cherry, it’s a softer hardwood so it may not be appropriate in rooms where chairs and furniture are moved around frequently. It’s also one of the most expensive hardwoods commonly available. But walnut’s natural beauty is worth the extra cost. Let us show you around our showroom. We have samples of both solid and engineered flooring in a number of wood species, in every style and plank width imaginable. We serve Greater Philadelphia, New Jersey, and Delaware and our helpful staff can help you choose the perfect flooring for you.